This chapter guides you through the installation of your personal copy of think-cell. If you are about to prepare the deployment of think-cell in a larger organization, you should skip this chapter and read the Deployment guide. think-cell runs on Microsoft Office 2007 SP2, 2010, 2013, or 2016 for Windows, with at least PowerPoint and Excel installed. think-cell also runs on Microsoft Office 2016 for Mac version 16.8.171111 or later, running on OS X Yosemite (10.10) or later. The installation of think-cell requires about 180 MB of disk space. Please close all instances of Microsoft PowerPoint and Microsoft Excel before installing think-cell. Open in order to install the software directly from the internet. Save to Disk and start the installation by double-clicking the downloaded setup file. On Windows, the installation wizard asks for the installation path, then copies the required files and updates the registry. If the installation wizard detects that you do not have sufficient privileges for a regular installation, a single-user installation will be performed. This means that think-cell can only be used with your current Windows login name. think-cell uses the same language as in the menus and dialogs of your installation of Microsoft Office, provided that it is supported by think-cell (see Language for more details). If it is not yet supported, English is used. 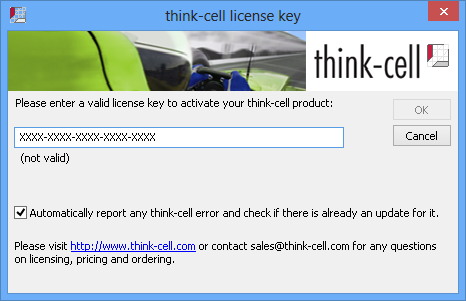 The public version of think-cell requires a valid license key, which expires after a fixed period of time. When you start PowerPoint with a think-cell trial version for the first time, or when your license key has expired, you need to enter a valid license key. 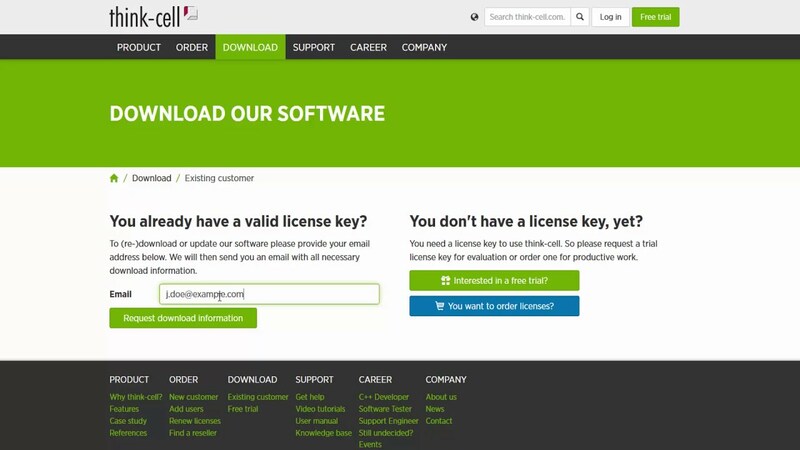 Please visit our website or contact our sales team to order such a license key for the first time or as a renewal of your existing deployment. In any case, you can always click the Cancel button and continue using PowerPoint without think-cell. To enter the license key later, click the Activate think-cell button in the think-cell ribbon group. The setting Automatically report any think-cell error and check if there is already an update for it controls error reporting (see Error reporting). We recommend to enable it to help us improve the software. No user data is included in the error report. The check for a new release is performed once when PowerPoint or Excel is started with think-cell installed and enabled. The automatic download runs quietly in the background and only occupies unused bandwidth. If the internet connection is interrupted or there is other network traffic, the download is paused until the network is again available. While PowerPoint is in on-screen presentation mode, any automatic update activities are suppressed. All files that are executed and installed by the automatic update are digitally signed by think-cell. If you cannot find a solution in the knowledge base or this manual, feel free to contact our support team. Open the More menu in the think-cell ribbon group and click on Request Support... Choose from the opening window whether you would like to attach certain slides to an email to think-cell’s support team. This often helps us to address your problem. After confirming with OK your e-mail application will open an email that is ready to be sent. At think-cell we are committed to stability and robustness as key factors for the professional use of our software. When an error condition arises while you are using think-cell, the software automatically generates a report that helps us to understand the problem and fix it in the next release. The error report only contains information about the internal state of our software. No user data is included in the error report. The software sends the error report encrypted. You might notice a short delay while an error report is being sent, but in most cases you can continue using think-cell as usual. If an update that addresses the error you encountered is already available, it will be installed automatically. For more information on think-cell’s automated error reporting, refer to section Error reporting. To quickly work around compatibility problems, or other issues arising from the use of think-cell, you have the option to temporarily deactivate think-cell without uninstalling the software. In the More menu in the think-cell ribbon group in PowerPoint, there is an option called Deactivate think-cell. When you select this option, think-cell will be deactivated immediately. With think-cell deactivated, charts are presented as regular PowerPoint shapes. To re-enable think-cell, click the Activate think-cell button in the think-cell ribbon group in PowerPoint. There is no need to close the PowerPoint application in order to switch between think-cell and plain PowerPoint. Before you alter think-cell elements without think-cell, be aware of potential compatibility issues (chapter Exchanging files with PowerPoint). Note: You do not need to deactivate think-cell in order to make your presentations accessible to coworkers or clients who may not have think-cell installed. Simply send them the same file you are working with – if think-cell is not installed, they will find a presentation with regular PowerPoint shapes.